N'Golo Kante says that it was an "unforgettable moment" to have his song sang by 80,000 supporters inside the Stade de France, but rejected lyrics which claim he 'cheats' at cards. After Sunday's 2-1 win over the Netherlands, the French players did a lap of honour to celebrate their homecoming after winning the 2018 World Cup. ​Chelsea midfielder Kante was serenaded first by his teammates and then by the entire stadium with a song which, devised by the squad, which went viral during the summer tournament. "Yes, this song spread during the World Cup," Kante told ​Goal UK. "I think that it was an unforgettable moment for me, it was very nice." The lyrics reference Kante's good nature, diminutive stature, and also mention how the France star stopped Lionel Messi in the last 16 win over Argentina. However, while the song is generally positive, Kante takes exception to another lyric which claims he cheats at card games. Apparently, the French players played cards a lot to pass the time when they were in Russia. "I'm not a cheat [at card games]!" Kante protested with a smile. "I'm a competitor, and those who lose like to give others a bad rap." Kante played in every minute at the World Cup until the final, when he was substituted after 55 minutes. 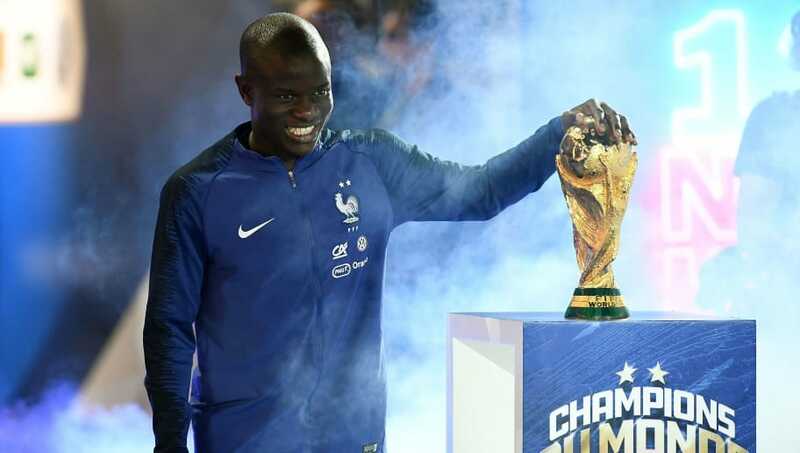 The World Cup triumph crowned an incredible few years for Kante, who has won the Premier League title with Leicester and Chelsea, and was named PFA Players' Player of the Year for his performances with the Blues.